Standard Baccarat, Mini Baccarat, Multi-player Baccarat or Punto Banco are all terms used to refer essentially to the same game (particularly by casinos listed on this site). It’s a very simple game that involves a bet being placed at the deal outset on either ‘Player’, ‘Banker’ or ‘Tie’ positions and letting the dealer do the rest. 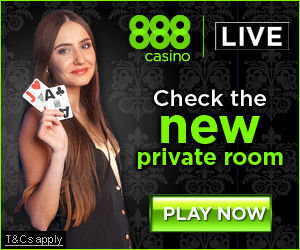 I don’t want to spend too much time on the rules of the game – house rules for every baccarat variation offered by listed casinos are included where relevant, and we’ve made the assumption that if you’ve found this site you’ve probably already played a game or two in your time and are just looking for a good live online option. If you read the above you are now aware that this is a pretty simple game. Make a bet choice, of which there are only 3, and wait for the deal outcome and hopefully the payout. But with 3 bet choices the obvious question frugal players will be wondering is whether there is a difference in returns attributable to the different bet options, and if so, which is the best paying bet? So the clear message to take here is to bet on the Banker and avoid Tie bets. Some live casinos offer what they call ‘Mini Baccarat’. Essentially you are playing identical rules to the games offered as ‘Standard Baccarat’, although the virtual table layout may be slightly simplified. The rules applying to both games are identical. The only difference is that the mini baccarat table is represented in single play format, rather than having 7 bet boxes. That is, the difference is only a presentational one and not really one that you should be concerned about when choosing which game you want to play. This may well be the most complicated live baccarat variation to completely understand. It offers players the option of betting at a number of stages during the deal – hence the name In-Running. The game begins with the dealer opening the betting round and you may bet on ‘Banker’ or ‘Player’ or ‘Tie’ just as you would playing standard baccarat – and if you place no further bets during the course of the deal, your payouts will be as if you paid the standard version. After the dealer deals a single card to the ‘Player’ hand, a second betting round is opened. Depending on the card dealt, game odds and handicap values for the Player and Banker positions are calculated and will apply to any bets placed. Then the Banker card is dealt, and again a betting round is opened with odds and handicap values applying based on the cards dealt – and so on until the deal concludes in accordance with the standard baccarat deal convention. The handicapping system used is loosely based on the Asian double handicaps commonly applied in sports betting. At the conclusion of the deal, players are paid out according to all bets placed and attributed handicap odds applied. Make sense? You’ll need more than a short explanation to get the hang of this one and should read the full In-Running baccarat house rules before playing. OK this is a really simple one. Think plain old standard baccarat with an optional side bet that gives you a buy-in to possibly win a progressive jackpot, or other amounts according to a payout table. 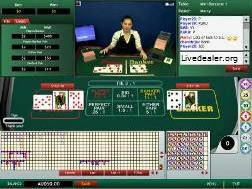 The win condition for the progressive jackpot is a particular Tie being dealt. Banker Pair (unsuited): Here you are betting that a pair is dealt to the Banker position. Payout is usually 11 to 1. Player Pair (unsuited): Here you are betting that a pair is dealt to the Player position. Payout is usually 11 to 1. Live casinos used to promote baccarat tables offering pairs side-bets as a different game/table. These days just about every live baccarat table table offers optional pairs side bets. Click the ‘pairs’ selector on the live baccarat summary page to view tables offering this side bet, and where you can play them. Dragon Bonus baccarat is standard baccarat with an optional ‘Player’ and ‘Banker’ bonus side bet. The payout on the bonus side bet will depend on how much your chosen hand wins by. If for example you take the ‘Banker’ bonus side bet and the Banker hand draws a Non Natural 9 and beats the ‘Player hand by 9 points, your side bet pays 30:1. Non-natural hand win by 9 Points 30:1 You place a Bonus side bet on a hand. Your hand wins by nine points with three cards. You win 30x your original bet amount and your original bet amount is returned to you. Non-natural hand win by 8 Points 10:1 You place a Bonus side bet on a hand. Your hand wins by eight points with three cards. You win 10x your original bet amount and your original bet amount is returned to you. Non-natural hand win by 7 Points 6:1 You place a Bonus side bet on a hand. Your hand wins by seven points with three cards. You win 6x your original bet amount and your original bet amount is returned to you. Non-natural hand win by 6 Points 4:1 You place a Bonus side bet on a hand. Your hand wins by six points with three cards. You win 4x your original bet amount and your original bet amount is returned to you. Non-natural hand win by 5 Points 2:1 You place a Bonus side bet on a hand. Your hand wins by five points with three cards. You win 2x your original bet amount and your original bet amount is returned to you. Non-natural hand win by 4 Points 1:1 You place a Bonus side bet on a hand. Your hand wins by four points with three cards. You win 1x your original bet amount and your original bet amount is returned to you. Natural hand Winner 1:1 You place a Bonus side bet on a hand. Your hand wins with a natural hand. You win 1x your original bet amount and your original bet amount is returned to you. Natural hand Tie Push You place a Bonus side bet on a hand. The Banker and Player hands are dealt two cards. The hands tie with a point count of eight or nine. Your original bet amount is returned to you. That is to say – a different way of framing the house commission. 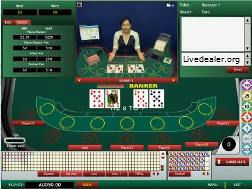 This form of live baccarat used to be offered at Microgaming powered live casinos (including the below), although it is no longer offered. Also, you have the option of taking the Super 6 side bet – here you are betting on a Banker win with a score of 6 and you get a 12:1 payout if successful. Click the ‘no commission’ or ‘Super 6’ selectors on the live baccarat summary page to view a range of platforms offering these tables, and where you can play them. Alternatively, below are a few options. For players who like to squeeze cards playing baccarat then you’ll be happy to know that there are now a number baccarat squeeze tables that can be played live online. VIP squeeze tables where only the highest staking player has the option of peeking at either Banker or Player cards. Choose from 3 bet options…”Dragon”, “Tiger” or “Tie”. The dealer will then deal 1 card to the Dragon and 1 card to the Tiger. – Dragon 1:1. If Tie, 50% of Dragon bet deducted as commission charge, remainder returned. If Tiger wins, bet is lost. – Tiger 1:1. If Tie, 50% of Tiger bet deducted as commission charge, remainder returned. If Dragon wins, bet is lost. – Tie 8:1, 10:1 or 11:1 depending on platform. If Dragon or Tiger win, bet is lost.